Arthonia pruinata (Pers.) Steud. ex A.L.Sm. 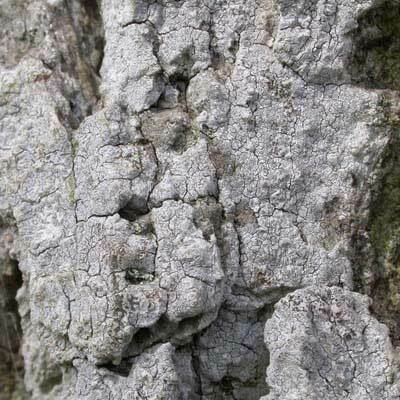 This small but wide-spreading, pale grey, smooth or extensively cracked, dry-bark epiphyte can be a dominating feature of old, isolated trees (especially sycamore and oak) on estates or in former parkland settings. The small, rounded or star-shaped, thickly powdered discs (to 1mm diam.) are glazed to such an extent as to render them almost inconspicuous against the dry bark of the host tree, resembling instead the rather grizzled remains of a bark fungus. A dab of fresh bleach (C) however, will have the immediate effect of turning it red. North-east Ireland. Small, heavily frosted discs, often forming large patches on the dry sides of old, standing trees: estates, parks, golf-courses, country house gardens, etc. Red reaction with fresh bleach. Simms, M. J., (2016). Arthonia pruinata (Pers.) Steud. ex A.L.Sm.. [In] LichenIreland.